After receiving the Wind Center of Excellence grant, the North American Wind Research and Training Center at Mesalands Community College is pleased to report that they have used these funds to assist students in gaining the skills, the knowledge, and the hands-on training necessary to secure jobs in this growing field. This grant has also given the Wind Center at Mesalands the opportunity to meet the industry’s need for highly-skilled workers in the utility wind operations and maintenance industry. 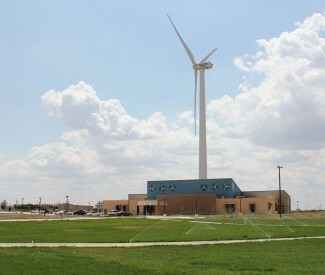 In January 2011, Mesalands was awarded $523,751 for the Wind Center of Excellence grant. These funds were a result of the State Energy Sector Partnership Program (SESP), as authorized by the American Recovery and Reinvestment Act grant awarded through the U.S Department of Labor. The SESP grant Centers of Excellence was established to expand existing green industry programs, or establish new programs that could be used throughout the State. Mesalands has used these funds to develop short-term certification programs, including a one-semester program resulting in an Occupational Certificate in Wind Energy Technology. Students in this program received grants to cover the cost of tuition, fees, equipment, and supplies. The College has successfully graduated 40 students from this program representing six states. One recent graduate is now the Site Supervisor at the High Lonesome Wind Farm of New Mexico. Orlando Encinias, 43, from Albuquerque, NM graduated in May 2012 from Mesalands and now oversees eight full-time employees and 40 wind turbines. Mesalands Wind Energy Students on top of the turbine adjacent to the North American Wind Research and Training Center. “This program really helped me. I will put it this way; I don’t think I would have ever gotten this position if I didn’t go to that school,” Encinias said. Other graduates of this program have obtained jobs throughout New Mexico, Texas and in Oklahoma. This program has also encouraged graduates to pursue a college degree. Sam Adams 51, from King, NC graduated from this program in December 2012 and has decided to continue his college education at Mesalands. 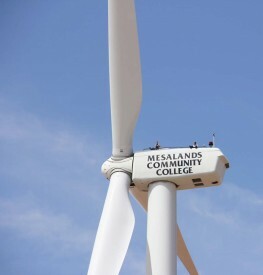 Mesalands has a 1.5 megawatt GE wind turbine adjacent to the Wind Center, in which students receive realistic hands-on training and troubleshooting experience. The turbine is also used for research projects in the future advancement of wind energy. In addition, through the Wind Center of Excellence grant, the College partnered with the Central New Mexico Workforce Training Center in Albuquerque, NM to provide a free course in the Introduction to Wind Energy to area students. This course included a day of hands-on training climbing the turbine at the Mesalands campus. Mesalands also partnered with Clovis Community College in Clovis, NM to offer free tower rescue training at the Wind Center for their wind energy students. The Wind Center of Excellence grant ends May of 2013. Mesalands is now accepting applications for students pursuing the Occupational Certificate in Wind Energy Technology. The next class will start January 22, 2013.